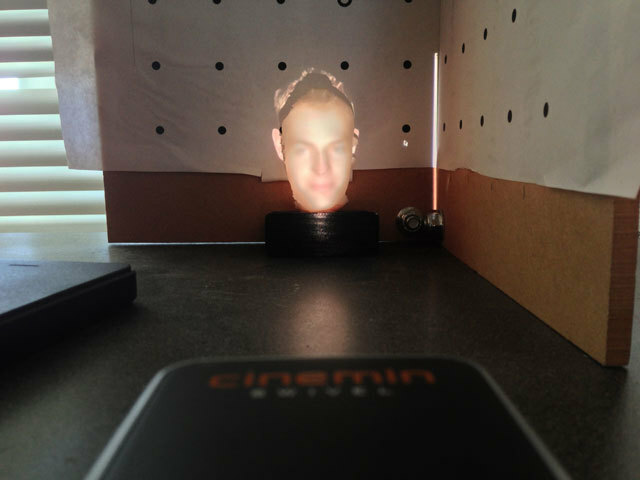 It's a 3D printed head of my friend that is being projection mapped with photoshopped pictures of himself. The head is about 2.5-inches tall, and the projections are 2 photoshopped images of his face: one with mouth open and one with mouth closed. I used jQuery to bind the mouseDown and mouseUp events to the mouth open/closed images. The script is hosted on a web server and the Raspberry Pi running Raspbian Wheezy ( http://www.raspberrypi.org/downloads ) is used to drive the projector. Why? Because I hope to find more and more ways to validate my 3D printer purchase. Add clutter at different depths to scenes when environment scanning to improve problematic tracking. Slowly swivel the subject while instructing them to be as motionless as possible. Since I only have one projector, I only needed a ~180 degree scan of the person which is easily done in one sweep. If you need a 360 degree scan, aligning several scans in software may be easier to accomplish than one perfect scan. Use Mesh Lab to clean up the scan mesh data and export to your 3D printer software/slicer. After printing the head and fastening it to a stand, if it can't stand on it's own, align the projector and the head so that it fills the area appropriately. This is pretty straightforward but a little bit of fiddling will be necessary for good results. Depending on how closely your projector can focus, you should print the head as large as possible that remains practical. My projector allowed me to print the heads around 2.5-inches tall sitting 8-inches away from projector. Todo: Improve projection quality by painting the 3D print with a reflective paint used for projection screens. I remember seeing something like this at a museum to narrate an exhibit.